18 many countries already have targets for shares of electricity.16 (See Chapter 5 for further country-specific information on electricity projections.) Heating and cooling from renewables will be much more difficult to attain in large shares, many experts said, and published scenarios support this view. Although heating and cooling technologies are fairly well understood and established, policies for heating are not as evolved or widespread as for electricity, and many challenges persist in terms of integration into the built environment. There are far fewer scenarios projecting heating and cooling shares relative to those projecting electricity shares, and only a handful of countries have policy targets or national-level policies for renewable heating and cooling.17 (See also buildings integration in Chapter 2 and heat- ing and cooling at the city/local level in Chapter 4.) Long-term transport shares are the most challenging to project, and the most uncertain, because the range of possible vehicle technologies and fuel types in the future is very broad, future oil prices are uncertain, and technology progress for many ele- ments, from vehicle batteries to advanced biofuels, remains unpredictable. These factors create uncertainty about what future transport systems look like. Fewer scenarios project shares of transport fuels, and in those that do, projections vary widely. However, quite a number of countries do have blending man- dates and/or targets for future shares of biofuels in transport.18 (See also transport integration in Chapter 2 and biofuels in Chapter 6. 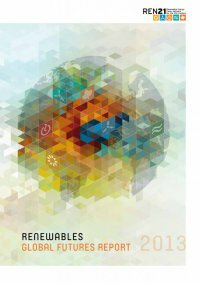 For more details on current biofuels mandates, see annual edi- tions of the REN21 Renewables Global Status Report.) Table 1 shows global sectoral-share projections for the years 2030 to 2050 from several scenarios. These include two conservative scenarios by oil companies, two moderate scenarios by the IEA (WEO “New Policies” and “450”), and four high-renewables scenarios by IEA ETP, GEA, Greenpeace, and WWF. Beyond these global shares, examples of country-specific policy targets and projections are given in the following sections.19 n Electricity Shares The global share of electricity from renewables in 2011 was 20%. In the EU, the share was 21%. A number of countries already produce very high shares of electricity from renewables, mainly from hydro- power in most countries. To illustrate the breadth of such countries, a list of countries with shares above 30% includes: Argentina (31%), Austria (68%), Brazil (85%), Cameroon (88%), Columbia (70%), Costa Rica (94%), Croatia (61%), Denmark (32%), El Salvador (65%), Ethiopia (89%), Finland (30%), Guatemala (63%), Iceland (100%), Latvia (55%), Madagascar (57%), New Zealand (73%), Norway (96%), Panama (59%), Paraguay (100%), Portugal (53%), Romania (34%), Slovenia (30%), Spain (34%), Sudan (81%), Sweden (55%), Switzerland (58%), Uganda (54%), and Venezuela (66%).20 At least 48 countries have targets for shares of electricity from renewables in the 2020–2030 time frame. Many of these targets represent a doubling or tripling of current shares. Examples of targets for 2020 include: Egypt (20%), Ireland (40%), Madagascar (75%), Philippines (40%), and Thailand (14%). A few targets extend to 2030, such as Kuwait (15%), South Africa (42%), and Tunisia (40%). And targets for three countries extend all the way to 2050: Denmark (100%), Germany (80%), and Malaysia (24%).a In late 2012, the Japanese government was expected to announce a target for a 30–35% share by 2030, as part of its new post- Fukushima energy strategy.21 Table 1: Sectoral Shares of Renewable Energy in Recent Global Scenarios Sources: See Endnote 19 for this chapter and Annex 2. Notes: Transport shares for IEA WEO, IEA ETP, and BP are only for biofuels; transport share for Greenpeace includes electric vehicles; transport share for WWF is entirely biofuels. Heat share for WWF is only industry and buildings. Electricity share for BP is estimated from graphics. Electricity share for GEA is based on the central "Efficiency" case. RENEWABLES GLOBAL FUTURES REPORT 01 how much renewables? Scenario By Year Electricity Heat Transport By 2030–2040 ExxonMobil Outlook for Energy: A View to 2040 (2012) 2040 16% — — BP Energy Outlook 2030 (2012) 2030 25% — 7% IEA World Energy Outlook (2012) “New Policies” 2035 31% 14% 6% IEA World Energy Outlook (2012) “450” 2035 48% 19% 14% Greenpeace (2012) Energy [R]evolution 2030 61% 51% 17% By 2050 IEA Energy Technology Perspectives (2012) “2DS” 2050 57% — 39% GEA Global Energy Assessment (2012) 2050 62% — 30% IEA Energy Technology Perspectives (2012) “2DS High Renewables” 2050 71% — — Greenpeace (2012) Energy [R]evolution 2050 94% 91% 72% WWF (2011) Ecofys Energy Scenario 2050 100% 85% 100% a) Germany's 80% share is reached through step-wise targets for each decade starting with 35% in 2020, and is part of its Energiewend movement to completely eliminate fossil fuels and nuclear.